I'm not one to like the widespread tracking of students' study habits but there are times where it can turn up some interesting info about how students are really using the newfangled digital textbooks. The following study from Luther College is one such. A total of 61 college freshman used a new interactive Intro to Programming textbook in the Fall of 2011. The textbook was written by the 2 professors teaching the class, and this study marks the first release of any study data on how the textbook is being used. Based on the paper released last week I don't think the students used their digital textbooks all too much differently from how they would have used paper textbooks (and related course materials). The textbook in question was an early version of Interactive Python by Brad Miller and David Ranum, 2 professors at Luther College.When you look it over online you will find that it consist of text, embedded videos, ActiveCode, a programming environment embedded in the textbook, and Codelens, a a software visualization tool which lets students work their way through code samples line-byline. With all these new tools to play with, the professors expected to see the students use them. Unfortunately, that didn't happen. The embedded videos were watched mainly in the first few weeks of class and then pretty much everyone stopped watching them. Codelens saw a similar drop off in student participation, though this tool did show an occasional spike in usage as the semester wore on. Pretty much the only part of this textbook (besides the text) that the students used on a regular basis was ActiveCode, the programming environment. This was used far more than the other 2 tools combined. 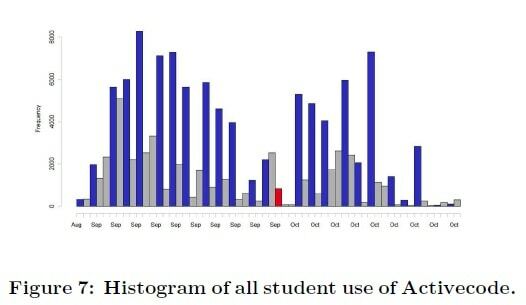 The report also showed that the textbook tended to be used on class days far more than the rest of the week, with in-class use accounting for much of the time. Later in this report the authors reveal that there was no strong correlation between the use of interactive features and students' grades, which makes me wonder what value do they add. While it's great to have evidence that the students are learning to program, if Activecode is all they're getting from a digital textbook then it's not a strong argument in favor of digital over paper. Computer Science students have ready access to programming environments, no matter whether they're using paper or digital textbooks. What's more, the fact they're using the one inside the textbook could even be argued as counterproductive for their long term success> I would think it would be better to introduce them to pro tools which they would use in later careers. In any case, this is just one study with just one textbook. The main takeaway for me is that this textbook and these authors are still in search of new features which will improve upon paper textbooks.